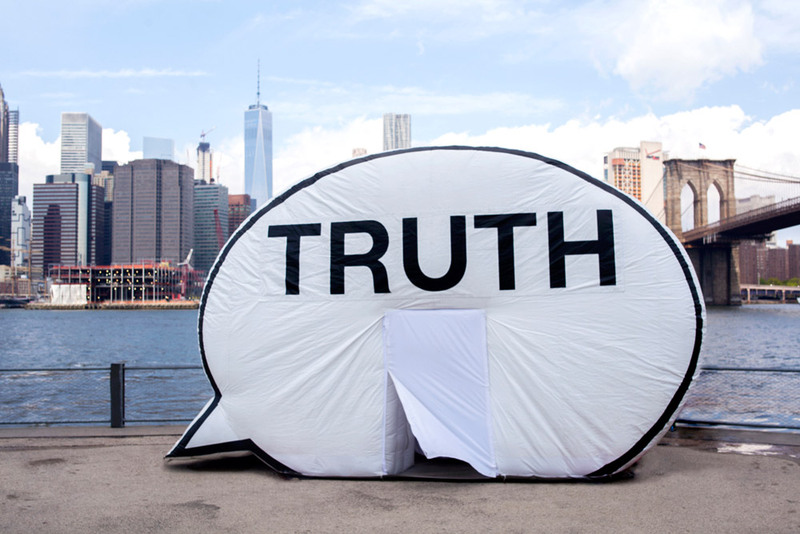 The Truth Booth is a project by the artists Ryan Alexiev, Jim Ricks, Will Sylvester, and Hank Willis Thomas, who are members of The Cause Collective. The Truth Booth makes a stop at the Portland Art Museum as part of the Cause Collective’s project In Search of The Truth (The Truth Booth). 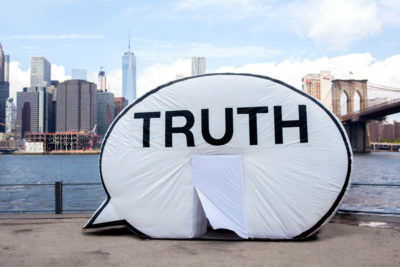 At each location, The Collective invites people to sit inside The Truth Booth (a giant, inflatable sculpture in the shape of a cartoon speech bubble with the word “Truth” printed on the side) and complete the sentence, “The truth is…” while being videotaped. The Truth Booth is the brainchild of Ryan Alexiev, Jim Ricks, Will Sylvester, and Hank Willis Thomas. Operating as a team of artists, designers and ethnographers, they work to bring thoughtful, interactive and engaging projects into local communities here and abroad. In this project, they are particularly interested in transforming public spaces into sites for candor and intimacy. By activating a U.S. tour, The Collective aims to empower hundreds of Americans to speak freely without fear of judgment or persecution. While everyone seeks the truth, two people rarely arrive at the same interpretation, which is why the project’s prompt of “The truth is…” is so powerful and revealing.